Ardell Lien had always dreamed of one day sailing around the world. 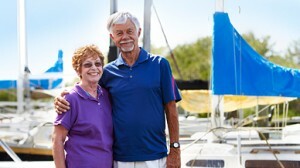 But when he was diagnosed with congestive heart failure, the retired military man from Caledonia, Minn., thought his sailing days were behind him. "I was down to 150 pounds," says Ardell, "and everyone in town knew I was on my way out. I slept 18 hours a day and had to crawl up the stairs to my bedroom." Then Ardell turned to Mayo Clinic. His doctors told Ardell that his kidneys had been damaged as a result of his heart disease. He would need a kidney transplant as well as a new heart. Critically ill, Ardell was hospitalized for several months before a compatible heart and kidney became available. The surgery was a success, and 10 days later Ardell left the hospital, well on his way to recovery. "I had no pain," says Ardell, "and each day was better than the one before." He credits Mayo Clinic staff for that. "Everyone at Mayo, from the people who work the desks to the physicians, nurses and technicians, was excellent," says Ardell. "My primary physician, Dr. Brooks Edwards, was always there with support and encouragement. And you couldn't find a finer group of professionals than the staff of Charlton 9 (the Transplant Center)." Six months after his transplant, Ardell roofed his house. The next summer, he remodeled another home from top to bottom. Then, at age 70, Ardell Lien sailed around the world. The man with a dream had become a man on a 27,000-mile, 15-month mission. Alone, in a 28-foot boat, Ardell intended to show the world what organ donation could do, and why it mattered. "I hope my journey will show how one life was changed for the better because of a generous, heroic organ donor," says Ardell.